Our dining room has changed quite drastically over the last few weeks… first with the new paint, and then with the floor to ceiling addition of built in shelving. And today, I’m sharing how I styled those dining room shelves…. I’ve been amazed at just how much the shelving has completely changed not only the dining room, but the entry way too. Since we have a really open floor plan, the dining room and living room are basically the first rooms your see when you walk into the entry way. And now, those floor to ceiling shelves stand front and center. And, whenever we host a big party, that second shelf is the absolutely perfect height to also serve as a great big buffet for food. I’m already imagining it and I can’t wait for Thanksgiving and Christmas! I love having everything at my fingertips… and I’m really excited to have a few of my serving pieces out of the cupboard! But as much as I’m really enjoying the way these shelves look right now, I’m already looking forward to switching everything up for different seasons and the Holiday’s. …get ready for another light switcheroo! That’s right, we’ve got a new light for the dining room! Our current one doesn’t fit quite right with everything we’ve done and will do, so I’m anxious to get the new one installed. And speaking of changes that we will be doing, remember that dining room table I talked about a while back? Well, we’ve finally decided what we’re going to build and I’m really looking forward to it! Love this. It looks so good. I love how the bottom shelves can work as a buffet. Perfection. Luv this idea! So beautiful with all your white lovelies. Oh my gosh I have one word. LOVE. Love you shelves and you did a fabulous job decorating them! I’m pinning! ABSOLUTELY BEAUTIFUL!!! Love everything about them!! The shelves are beautifully styled, love the matching set of the pfaltzgraph casseroles. Gorgeous. The idea of different depths for the shelves is genius! Love white dishes, too. They’re simple, clean, and classy without being too stuffy. Your shelves look awesome!!! Looks awesome! The shelves are so nicely styled too. You always knock it out of the park with new ideas. I’m sure I am not the only one looking around my house for wall space to do that now lol. love it and where do you get the step stool? LOVE LOVE the shelving you added and the pretty displays you added to them!! I’m a new reader to your blog and just want to say that I absolutely LOVE this! What a great idea – I love all the white against the dark stain. I am looking forward to seeing what you do for the holidays. Ah! I knew you would style them amazingly. They look beautiful! I love the combo of the wood, metal, glass, and white ceramic. So timeless. Can’t wait to see the light you chose! I featured your amazing styled shelves today as one of my Friday Favorites today on my blog. I LOVE the look of what you have done. I have some of those wire milk crates and have never thought of actually putting them to use out on a shelf like that! Hey Shayna! Gosh, where do I start! I love this project so much. 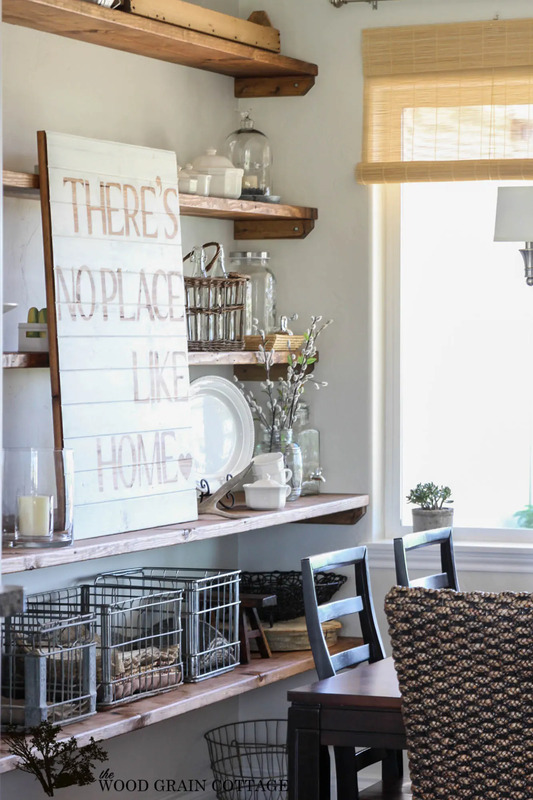 Chunky open shelving, white stoneware, industrial style crates….I am so giddy! Pinning a few pics and shared on Facebook. I love this! However, I was wondering do you have any problem with the wood sagging in the middle? Great news…I was wondering the same thing! What are the different depths of shelving. Just wondering what kind of wood you used for the shelves?